Caroline..Artist Afloat: A trip down memory lane. I am now in Sharnbrook, the village where I was born. 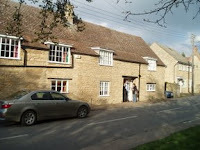 This is Upper Farm, the house I was born in and lived in for half of my life. Luckily I know Julia and David who had bought the house from my mother, so I went visiting with my friend Kathy who I am staying with while here. Julia very kindly let me look round the whole house,and though of course it is now decorated differently, and with great taste I might add, the memories came flooding back. Although it all seemed so much smaller than I remember!! We had a lovely cup of tea and a gossip with Julia and David, then wandered off back along the high street.